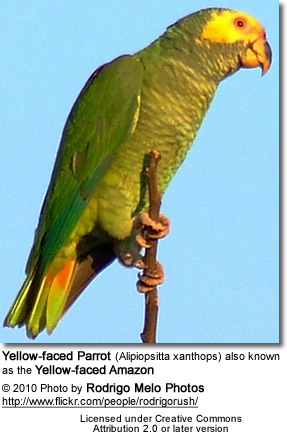 The semi-nomadic Yellow-faced Parrot (Alipiopsitta xanthops, previously Amazona xanthops / Salvatoria xanthops) is found in eastern and central Brazil and occasionally in the adjacent Bolivia. Their preferred habitat includes semi-arid scrubland habitats with low trees (cerrado). Their numbers are declining and they have alreadydisappeared in large areas of its former range. This species is sometimes referred to as Yellow-faced Amazon, but recent research indicates that this species is much closer related to the Short-tailed Parrot (Graydidascalus brachyurus) and to the members of the genus Pionus. Their personality is supposed to be comparable to the Pionus parrot as well. These parrots average 10.5 ins (27 cm) in length. Their plumage is mostly green, edged with dark green. The forehead, lores (the regions between the eyes and bill on the side of a bird's head), crown and ear-coverts are variably yellow, some older birds have entire head and abdomen yellow to orange; edge of wing yellowish-green. Front of forehead in many birds bare with plucked appearance. The tail is green with greenish-yellow tips; outer tail feathers with broad orange-red band. The bill is horn-colored with black base and their irises are yellow. The feet are greyish-flesh color and their cere pink. Immatures have less yellow on head and abdomen, and their irises are dark. Breeding has seldom been achieved in captivity. The basic requirement would be a compatible pair that needs to be isolated during the breeding season due to increased aggression towards other birds during this time; they also require spacious accommodation and a nest box 25 x 25 x 60 cm (10 x 10 x 24 ins) with entrance 8 cm (3 ins) in diameter. They tend to be aggressive towards caretakers. The breeding season begins early May. The hen lays 2 to 4 eggs, which she incubates for 26 days. The young fledge when they are about 8 weeks old.